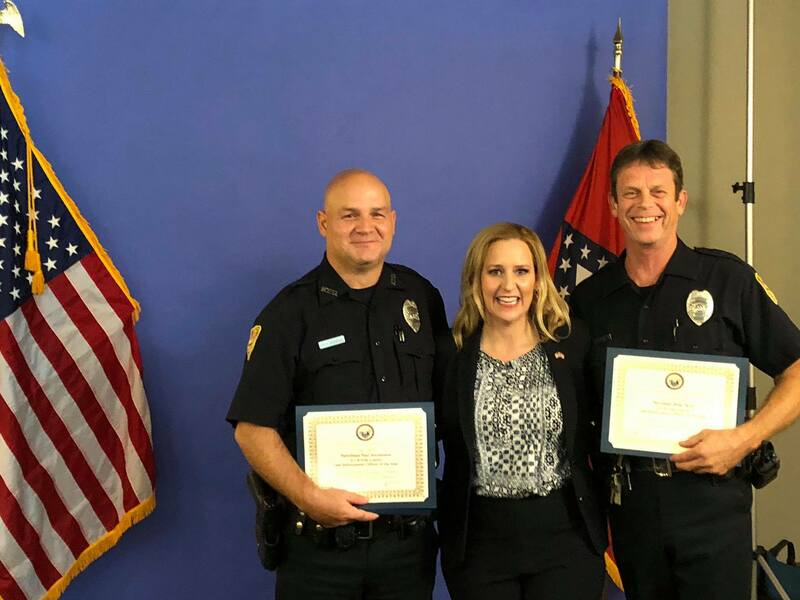 Editors Note-In addition to Corporal Vacco, Mena Police Department Officers Paul Arceneaux and Mike Wolf were recognized as outstanding police officers from Polk County. BENTON – Arkansas Attorney General Leslie Rutledge today hosted the annual awards and recognition luncheon during the 2018 Law Enforcement Summit at the Benton Event Center, where she announced Arkansas State Police Senior Corporal Becky Vacco as the Law Enforcement Officer of the Year. A record 648 officers from across the State attended the summit, which is in its 16th year. Corporal Vacco recently assisted three law enforcement agencies in investigations of crimes against children. One was a case of an 8-week-old child with 18 broken ribs and a leg fracture. The case resulted in the father pleading guilty to first degree battery and sentenced to 35 years. Another case was the death of a 23-month-old child that resulted in a life sentence for the suspect. In the third case, a 3-week-old male had a broken clavicle and numerous bruises including one that had caused brain swelling and seizures. Vacco conducted numerous interviews and after seven months arrested both parents. The victim, now 2, will require round-the-clock care for the rest of his life. The other Regional Officers of the Year included: Wildlife Officers Troy Sayger and Matt Tenison, Arkansas Game and Fish Commission, Southeast Region, for their work to save a suicidal teen in inclement weather; Corporal Brandon Cook, Arkansas State Police, Southwest Region, for saving a woman who had jumped off a bridge; Lieutenant Chris Ameling, Pulaski County Sheriff’s Office, Central Region, for tending to a woman trapped inside a structure fire by keeping her calm until firefighters could arrive; Patrolman Lyle Fultz, Fairfield Bay Police Department, Northwest Region, for entering a burning building to rescue a resident, saving his life. A list of the outstanding officer winners from each county can be found at the conclusion of this release. Rutledge also presented a VALOR tribute, which is given in honor of members of the law enforcement community who tragically lost their lives while in the line of duty this past year. This year’s tribute was presented to K9 Trooper Hemi with the Arkansas State Police. Rutledge gave special recognition to Richard Davis, the Director of the Arkansas State Fusion Center, who passed away in May. The summit was kicked off by Utah Attorney General Sean Reyes, who spoke about his efforts to combat human trafficking. Attorney General Reyes has been a leader and an international voice leading Utah to aggressively fight human trafficking by introducing innovative education campaigns, support of anti-human trafficking legislations, victim recovery and advocacy. The success of his multifaceted effort has been accomplished by grassroots and non-governmental organizations efforts, partnerships with local law enforcement officers and agencies, as well as work initiated by his office through the Utah Trafficking in Persons Task Force and prosecutors of Utah SECURE Strike Force. Dennis Debbaudt spoke to attendees about autism risk and safety management in various emergency situations, especially in regard to individuals on the autism spectrum. It is critical that first responders have working knowledge of autism and the wide variety of behaviors individuals on the autism spectrum may exhibit in emergency situations. And the afternoon concluded with a presentation from Jeffrey McGill, formerly with the Okalossa County, Florida, Violent Fugitive Task Force. McGill discussed surviving traumatic stress to address the far reaches of a critical incident and what officers, supervisors, trainers and families need to know about traumatic stress.